1. Added support for TitaniumBackup, GoldenDict and another program with a Custom Patches. Custom Patches – Patches for this specific program written by me or by anyone in the file format txt. 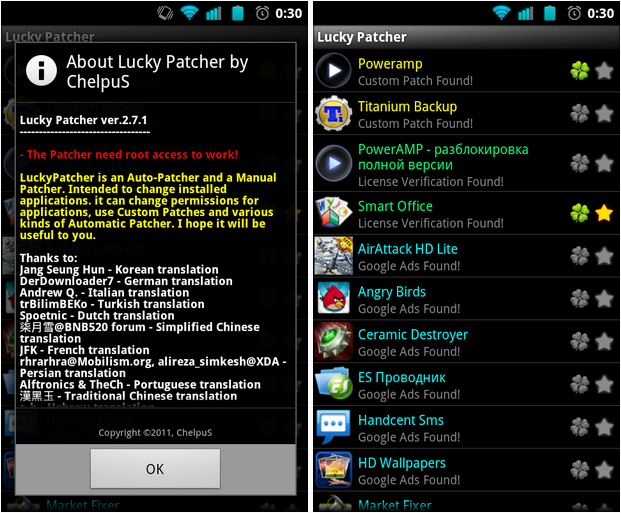 (These files should be put in the directory / sdcard / LuckyPatcher / – it is automatically created Lucky patcher and already has a few patches). 2. Program, which is custom patch in the folder / sdcard / LuckyPatcher / move to the top of the list and are marked in yellow. 4. If the patch is run for all the inscriptions will be green, but in the end it will give greetings and perhaps instructions, it will depend on person has made a custom patch. 5. If you press the “Add for patch on reboot!” on the program contains a custom patch, boot the device will use this custom patch, rather than the standard rezalka license. 6. Updated a little bit About. – Signatures of advertising changed, dual file manager does not have to fall. – Modified the signature of advertising again, try to applications that previously flew. – Removed bug removal of non-existent Root rights, and even in version 1.0.3 it worked fine, but the message is deduced. – Modified the signature cut of advertising, and now the application does not need to throw critical errors, well, or much less frequently. – Made a restyling display a list of software. – Now the software is found in which Google is moving higher and is marked in blue. – And of other minor fixes. > Update “About” and convert links to clickable. > Fix bug to Proxy server for Google Play.